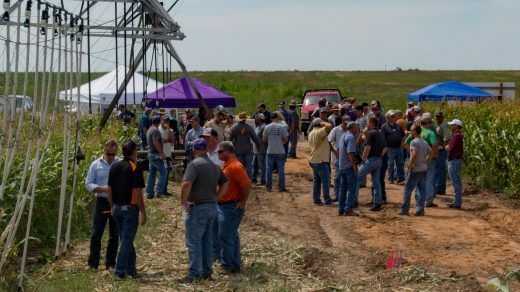 On a sun-drenched August day, a group of farmers, sales representatives, government officials and university researchers were gathered, not in a conference room, but in the middle of a cornfield. Under the unrelenting sun, everyone had one thing on their minds: water, and how to use less of it. This is a Water Technology Farm, one of the working farms sprinkled across the state whose owners have volunteered to focus on water conservation, in addition to crops and livestock. University researchers often tout new irrigation technologies as efficient or cost-effective, but farmers never really know how those technologies – so triumphant in a controlled experimental field – will perform in their own fields. With Water Technology Farms, producers can see first-hand how the latest irrigation technologies work in a real-world setting. At six different Water Technology Farm field days across the state, K-State extension water resource engineer Jonathan Aguilar explained to the public how these farms work: by showcasing technologies such as mobile drip irrigation (MDI), evapotranspiration (ET)-based scheduling tools, soil water sensors and other tools, producers can see visible proof about how each of these experimental methodologies can assist them in their efforts toward water conservation.